This regal dish, Mughlai biryani is fit for a king and was probably eaten by many too. This recipe combines ingredients typical in the Mughlai style of cooking—it's a perfect one-dish meal for when you have company. Put the almonds in a bowl of hot water (enough to cover them) and set aside for 10 minutes. After 10 minutes, remove the skins from all the almonds by pressing each one between your thumb and forefinger. The almonds will slip out of their skins. Mix the garlic and ginger pastes and the peeled almonds and grind the mixture into a smooth paste in a food processor. Wash the rice in a sieve and add enough water to fully cover the rice—at least 4 inches over the surface of the rice. Add salt to taste. Boil the rice until it is almost done. To determine when the rice has reached that stage, remove a few grains from the pot and press them between your thumb and forefinger. The rice should mostly mash but will have a firm, white core. Turn off the burner. Strain the rice through a colander and set it aside. Heat 3 tablespoons of oil in a pan and fry two of the onions until they are caramelized and golden brown. Drain and set the onions aside on paper towels. Heat 3 tablespoons of oil in another pan and add the whole spices—cinnamon, cardamom, cloves, and peppercorns. Fry the mixture until the spices turn a little darker. Add the two remaining onions and fry them until they are translucent. Add the ginger-garlic-almond paste and fry for two to three minutes. Add all the spice powders—coriander, cumin, and garam masala and mix well. Fry the mixture until the oil begins to separate from the masala and then add the lamb or chicken. Continue frying until the meat is fully sealed; it will become opaque and lose its pink color. Add the yogurt, lime juice, stock, coriander and mint leaves and salt to taste (if needed). Mix well. Cover the pot and allow the dish to cook until the meat is tender. If you are using food coloring, divide the rice into three equal portions and put each portion into a separate dish. Add the orange food coloring to one portion of the rice and the green food coloring to another portion. Leave the third portion white. With each portion, mix the rice until all the grains are well colored. Set the rice aside for 10 minutes, and then mix the three portions in a bowl. Grease a deep baking dish and evenly layer the cooked rice and meat (and its gravy) to form at least two sets of layers—rice-meat-rice-meat-rice. Garnish with the previously caramelized onions. Cover the dish tightly. If the dish does not have a cover, use two layers of aluminum foil with the shiny side of both layers pointing down toward the rice, and secure the foil to the dish with baking string. Put the dish in a preheated oven set at 350 F. Bake for 20 minutes. Turn off the oven and let the dish sit in the oven until you are ready to eat. Remove the foil only when you are ready to eat. 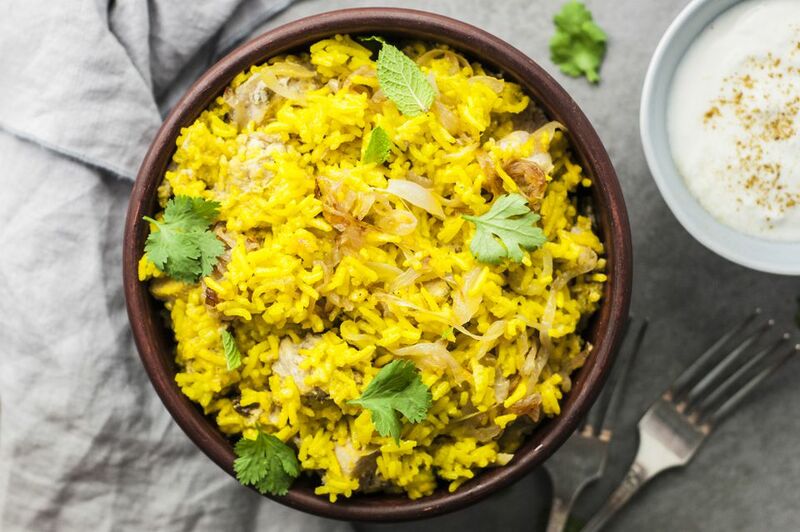 To serve Biryani, gently dig in with a spoon so that you get through the layers. While Mughlai biryani tastes great by itself, add a raita-like chatpata channa raita (chickpeas in hot-sour yogurt) to really perk up the flavor.